Additionally, Treehouse Software’s tcVISION is Featured on the AWS Partner Network Blog. Read the Blog Here. 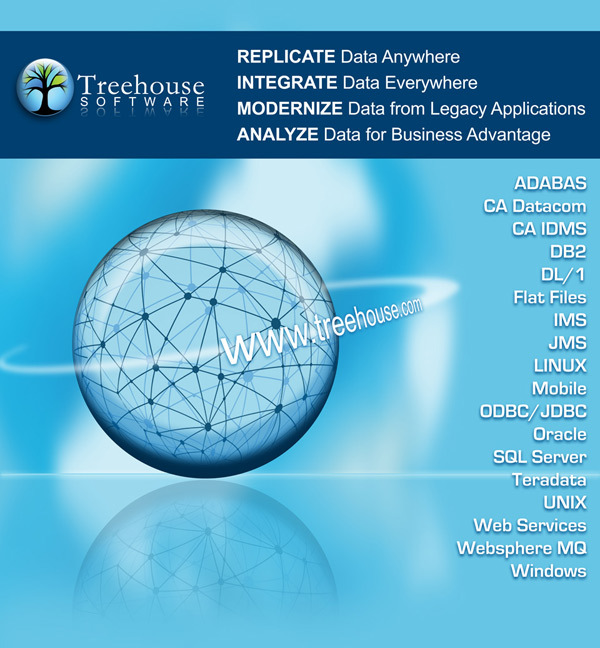 Treehouse Software is an AWS Technology Partner and a global leader in providing real-time and bi-directional data replication between a variety of mainframe and non-mainframe sources, including (Mainframe – z/OS and VSE): VSAM, IMS, Db2 z/OS, Adabas, CA Datacom, and CA IDMS; and (Non-mainframe): AWS, Microsoft Azure, PostgreSQL, Oracle, Microsoft SQL Server, IBM Db2 LUW and Db2 BLU, IBM Informix, Kafka, MongoDB, Hadoop, SAP Hana, and more. Give us 90 seconds of your time, and we’ll quickly show you how tcVISION enables real-time and bi-directional Mainframe-to-Cloud and Open Systems data replication. Our video walk-through shows how tcVISION‘s GUI interface allows users to easily model and map data, and create links between data sources and target systems. tcVISION‘s intuitive interface supports simple to complex replication scenarios. tcVISION supports a vast array of integration scenarios throughout the enterprise, providing easy and fast data migration for mainframe application modernization projects and enabling bi-directional data replication between mainframe, Cloud, Linux, Unix and Windows platforms. This innovative technology offers comprehensive abilities to identify and capture changes occurring in mainframe and relational databases, then publish the required information to an impressive variety of targets, both on-premise and Cloud-based. tcVISION acquires data in bulk or via change data capture methods, including in real time, from virtually any IBM mainframe data source (Software AG Adabas, IBM Db2, IBM VSAM, IBM IMS/DB, CA IDMS, CA Datacom, even sequential files), and transform and deliver to virtually any target. In addition, the same product can extract and replicate data from a variety of non-mainframe sources, including Amazon Aurora, PostgreSQL, Adabas LUW, Oracle Database, Microsoft SQL Server, IBM Db2 LUW and Db2 BLU, and IBM Informix. Visit the Treehouse Software website for more information on tcVISION, or contact us to discuss your needs. Chris Rudolph and Kevin Heimbaugh, Senior Technical Representatives for Treehouse Software, visited a customer site (a large retail and distribution company) to perform a five-day proof of concept (POC) of tcVISION with bi-directional replication between Software AG’s Adabas and Microsoft SQL Server. Additionally, there were a few other items the customer wanted the Treehouse team to address, including support for date formats; timestamps for bi-directional replication to avoid update conflicts; using Predict views to define multiple SQL Server tables; and support for MUs and PEs. Chris noted that everything on the customer’s list is easily supported, and there are several options for the update scenarios that can be used. After the tcVISION components were installed, the POC began by using tcVISION’s Control Board to define a metadata repository database in SQL Server. Once that was set, the teams moved on to import the first Adabas file’s metadata using tcVISON’s Metadata Import Wizard. As part of this process tcVISION generated Adabas to SQL Server schemas and field-to-column links as well as created target tables in SQL Server. Bulk Transfer scripts were created using a wizard to read the Adabas file on the mainframe, and load the data into SQL Server using the SQL Server bulk loader. Chris created a control script to show how tcVISION can concurrently bulk transfer multiple Adabas files into SQL Server This required increasing the tcVISION Manager’s VSE partition size to successfully test multiple load scripts executing in parallel. The teams moved on to define the real-time change data capture (CDC) scripts necessary to process the Adabas PLOG. The tcVISION scripts use a two-phase approach to queue captured Adabas transaction on the open platform, then transform and apply the transactions to SQL Server. The scripts were set up to automatically generate detailed logs to track the PLOG transactions captured, SQL statements successfully applied to SQL Server, failed SQL statements, and informational items such as auto-corrected data and transactions rejected due to processing rules. Now that several tables were defined and loaded, the bi-directional process was set up. SQL Server CDC was enabled for each table to be replicated. The team made a change within SQL Server and verified that the change show up in the SQL Server CDC tables. The SQL Server-to-Adabas mappings were defined in the tcVISION metadata repository, including the “back update check” to ensure only non-tcVISION transactions are captured, and the scripts on both Windows and mainframe were defined to create the LUWs from the SQL Server CDC and apply the changes to Adabas. CDC from SQL Server to Adabas was successfully tested. Chris then showed the ability to create Journal replication where each change can be captured by replication type. The team spent time creating a few more mappings so multiple file / table updates could be tested, in addition to doing updates while the scripts were stopped to simulate a lost connection. This included setting up a new script to process copied PLOG datasets created by the ADARES utility. The team defined the remainder of their Adabas files to the metadata repository. Some were set them up for bi-directional replication, and others were setup for unidirectional replication and Journal replication. Everything work as expected at the wrap-up meeting where the team provided a live demonstration to management of tcVISION and the items accomplished. The final tcVISION presentation and demo went very well, and everyone was pleased with the progress made during the week. tcVISION provides easy and fast data migration for mainframe application modernization projects and enables bi-directional data replication between mainframe, Linux, Unix and Windows platforms. tcVISION acquires data in bulk or via change data capture methods, including in real time, from virtually any IBM mainframe data source (Software AG Adabas, IBM DB2, IBM VSAM, IBM IMS/DB, CA IDMS, CA Datacom, even sequential files), and transform and deliver to virtually any target. In addition, the same product can extract and replicate data from a variety of non-mainframe sources, including Adabas LUW, Oracle Database, Microsoft SQL Server, IBM DB2 LUW and DB2 BLU, IBM Informix and PostgreSQL. Treehouse Software representatives are preparing for the upcoming WAVV Conference, which will be held April 13 – 16 at The Embassy Suites in Covington, KY. If you are attending the conference, stop by the Treehouse Software booth and say hello! tcVISION for enabling ETL and bi-directional data replication between mainframe, Linux, Unix and Windows platforms. tcACCESS for integrating mainframe data and applications with open systems and Windows. Additionally, Chris Rudolph, Senior Technical Representative for Treehouse Software will be presenting, “Replicate Data in Real-time — Anytime, Anywhere (Live tcVISION Demonstration)” on Tuesday, April 15 at 11:00 AM as part of WAVV’s vendor presentation series. WAVV is a user group promoting the interests of the users of the VSE, VM, and Linux operating systems. WAVV holds the annual conference, which consists of over 100 educational sessions as well as an exhibitor show where vendors of VSE, VM, and Linux related products show their wares and meet with customers. More information on WAVV can be found on their website.